I wrote about this scarf last month, but wanted to officially post the pattern with decent pictures. 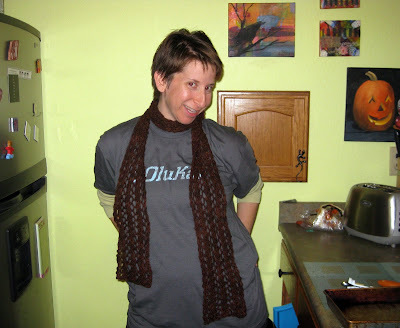 That's my sister Hil modeling the scarf after I gave it to her last night. She's just starting to get a baby bump. It's a simple one row lace scarf knit on big needles. The Malabrigo yarn that I used is pillow soft. I'm sensitive to wool and usually can't wear it next to my skin, but this yarn didn't bother me at all when I tried on the scarf. 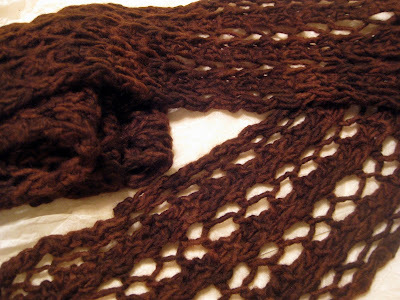 If you want your scarf narrower or wider, just be sure to cast on a multiple of four stitches. I think this pattern would also look good in a fine weight yarn using much smaller needles. Using size 15 needles, cast on 16 stitches. Row one: *K2, YO, slip one stitch purlwise, K1, PSSO*, repeat to end of row. Repeat row one until scarf reaches desired length. I just copied your pattern to my book. The scarf would make a great gift for my sisters too. I have never heard of Soak so thank you for the introduction to a new product. Have a wonderful day. What a beautiful scarf and the model is looking gorgeous in it! Baby bump is looking CUTE! Lovely scarf and model. I have yet to get my hands on Malabrigo - heard so many good things about it - but I'm trying really hard to not buy yarn until I finish some projects!!! What a pretty scarf! It's a great gift! I ordered some white fleece scarves for my gf's and I'll add yo-yo's to them. Hope they like them! It's beautiful, Stacy! Another pattern I will try out, maybe over the break. Love the open and airy stitch. Oh, it's beautiful. 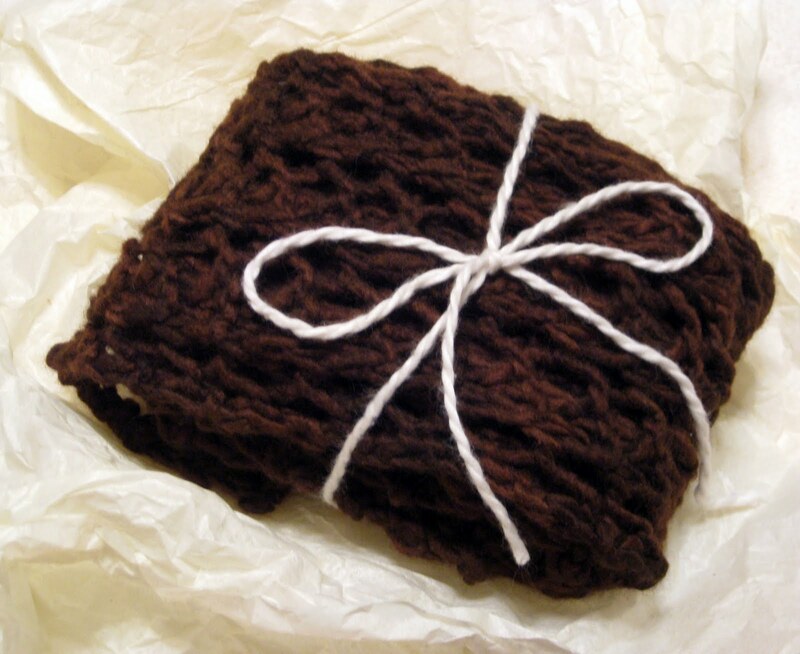 I love that it's lacy -- the perfect gift! Hi :) Just popping over from Linda's blog and I love the lacey look of your scarf. So pretty :) Thanks so much for sharing the pattern! Scarves are always great gifts. I've bookmarked this! This looks like an AWESOME pattern! Now I just need to get brave and learn more than the basic knit stitch! Love the look of this scarf. Will make after I am done with 2 pairs of socks. Where do you get "SOAK"? This is nice and easy and fun — thank you! I'm making it from some shimmery ribbon yarn and it's gorgeous. I'm going to make a couple more as gifts! Love this pattern! I knit it in a cream coloured light wool blend for my daughter. Cast on 24 stitches and joined the ends to make a circular scarf. Gorgeous! Hi Love the pattern. I want to make it wider. what is the pattern "multiple" to add on stitches? Hi Janine. I haven't knit this scarf in a long time, but the instructions say to make it to wider to cast on extra stitches in multiples of four. So instead of casting on 16 stitches, you could cast on 20 or 24 or 28, etc. I hope you see this comment. I could not reply to your email. Thank you for your kind words about the patterns. Oops, that should have been, "... to make it wider ..."